Today we left the beautiful, picturesque town of Monteverde and stopped for lunch and souvenirs after waiting for the road to open after construction. We then went to a presentation at Boston Scientific which was very interesting. After that we traveled back to our first hotel in San Jose. But let’s talk about yesterday. 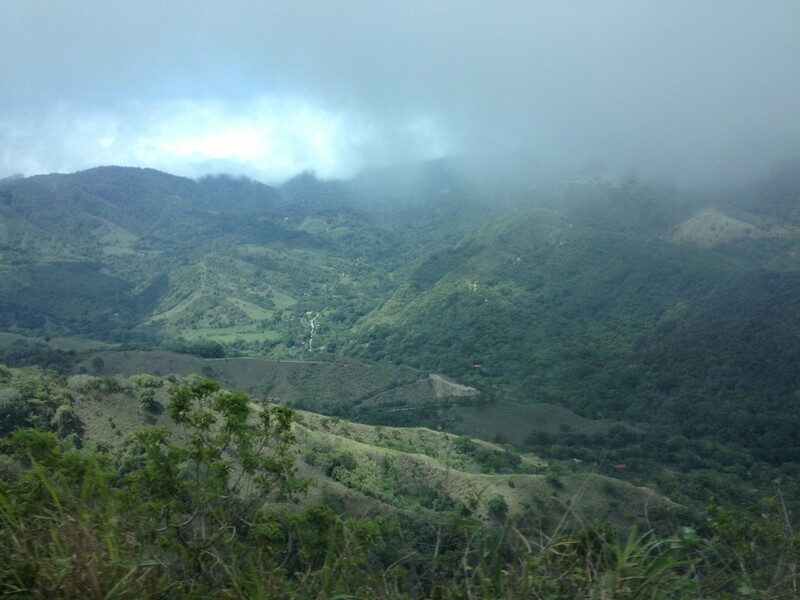 Yesterday we had a free day in Monteverde so a lot of our group went horseback riding in the morning, and most went zip lining in the afternoon as well. One of the other girls and I walked around the town in the morning while the others were out horseback riding. We did some souvenir shopping and got lunch (I got a chicken empanada and a small Coca Cola— it only cost 1500 colones, roughly $2.70, and it was delicious. The lady even complimented me on my Spanish, which made me feel awesome). Then we regrouped at the hotel to go zip lining. We went to Extremo Park, one of the many adventure parks in the area. The guides gave us all a quick lesson on how to position ourselves and how to stop, then we were on our way. We started off on a short zip line, then worked our way up to a longer one where you had to double up (that was only the third zip line). In the middle of the course you rappel down from a platform and land at the area to do the Tarzan swing. For that they harnessed you into/onto the rope swing then pushed you off the platform, then you would swing back and forth like Tarzan. I screamed the entire time. Most of us hit a vine that was near a branch; I was so afraid I was going to hit the branch! After 13 zip lines (and lots of uphill walking and a final set of stairs that looked like the Great Wall of China), you end up at the 14th and final zip line. This line was 1 kilometer long, and you had the option of going down with another person or doing the Superman. The Superman is exactly what it sounds like— instead of being clipped to the front of the harness, they clipped your back to the cable and had a cable for your feet as well, so you looked like Superman (except you couldn’t put your arms out like him because it would cause too much drag). I opted for the Superman, but I was so nervous about it. Once they had me strapped in, I was shaking waiting to take off. It was so fast, and the views were amazing. I was glad I did it. I’m sore today, but it was totally worth it. That night we went to dinner to celebrate Anju’s 20th birthday. I had the blackberry pork chop and it was excellent. We went to bed earlier so we could be ready for our long day of travel today. Even after a good night’s sleep, I’m still exhausted! That’s my cue to go to bed. Buenas noches! Our ascent into the mountains. 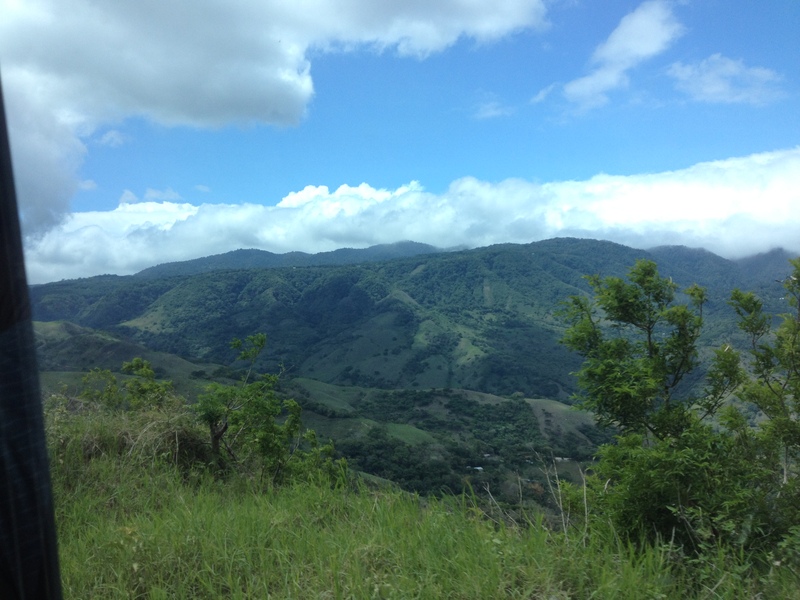 Today we ventured into the mountains of Costa Rica to Monteverde. About two thirds of the way there were paved roads, but the last third was nothing but dirt and rocks. After a long, bumpy, twisted ride, we arrived at our hotel. The staff welcomed us with fresh lemonade (which was delicioso) before we each did our own things (most of us walked into the center of the town and poked around in various souvenir shops). We’re so high we can practically reach out and touch the clouds. We all went to dinner at the Treehouse Restaurante & Cafe where we enjoyed listening to live music (including “Wonderwall,” “Black Magic Woman,” and “Gravity,” among others). As the name suggests, the restaurant is located in the middle of a tree, so it was pretty cool to say the least. Some of us were having too much fun to leave; others were getting tired after a long day of traveling, so those who were tired (myself included) returned to the hotel while the others stayed to enjoy the music and atmosphere a little longer. The walk back was short and dry, but as I write this it is pouring out, which is expected since it is their rainy season here in Costa Rica. You learn to always have a rain jacket with you, even if the skies are clear. Upon returning to my room, I was greeted by 3 rather large beetles which frightened me. It wouldn’t have been so bad if it were Paul McCartney and Ringo Starr, but they weren’t those kinds of Beatles. Luckily one of the men in our group had walked back with us and was staying in the room next door so he chased them away for me (after he had a photo shoot with them first). Then when I was getting ready for bed I saw a daddy long leg spider crawling across the floor. I still had my sneakers on so I gathered up my courage and killed him (after the third attempt). Needless to say I have the heebie jeebies now, so I zipped up all my bags and I’m probably going to stay up until my roommates get back. Close encounters with bugs you don’t like tend to get the adrenaline going and wake you up. Tomorrow we are scheduled to tour the rainforest and later a butterfly garden and a reptile and amphibian exhibit. I’m looking forward to these events, and I hope I see some animals up close and personal (no bugs though), and take some awesome pictures. As I write this there are less than 24 hours until we leave for Costa Rica. The excitement is building but so are my nerves. I’ve had the bulk of my stuff packed for about a week now, but now I have to throw in the last-minute things like my phone charger and the laptop that I’m typing this on. As someone else mentioned, I too have a million lists. I’m so afraid that I’ll forget something (even though we’re only going for about two weeks). I’ve even woken up in the middle of the night to add another thing to my list! There’s no such thing as being over-prepared. My suitcase is packed, I have to finish packing my carry on now, and after having car troubles this morning, I am more than ready to get to the tropical oasis of Costa Rica (even if it is for school). Escribo de nuevo cuando estoy en Costa Rica!